A few months back I was making nightly sketches (something I really should get back into). Just getting things out of my brain and onto paper. 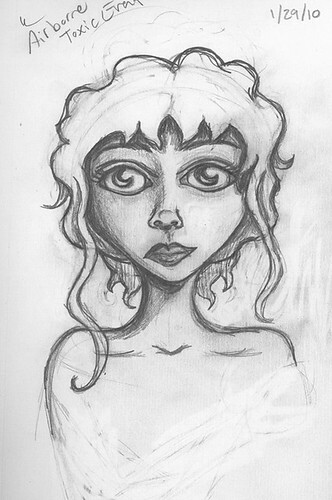 Most of my sketching is very organic, without too much forethought going into them. I'll have a basic idea, and after that things flow in whatever direction they want to go. I've tried to force myself into a neater, cleaner style, but it rarely turns out right. I have a pretty set sketching style. Where I use short loose strokes and slowly tighten things up as I see how things are developing, and the image slowly reveals itself to me. Its almost like scratching a lottery ticket to reveal the numbers below. I sit there scratching into the paper to see what exactly is going to end up staring back at me. This is what ended up looking back at me one night. 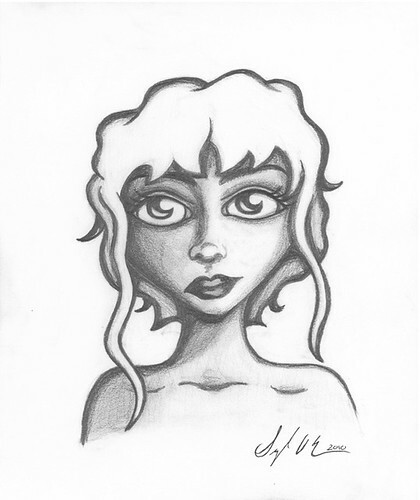 I did the initial sketch one night, and then a few weeks later I added a little shading. Its really neat watching these girls I draw come into existence. I nicknamed her "Curl Girl". Recently I decided to try and make this sketch into a drawing. So one night I set out to make a cleaned up version. While I like the outcome of this first attempt, it didn't end up looking exactly as I had planned. I ended up nicknaming the drawing "Whisp" because of the whisps of hair flying in the front. I'll probably try to make her as drawing again, but without getting rid of the "sketchy" feeling entirely and without such thick lines. I really like the character some of the sketchy feeling gives to the original sketch. There may also be more to the drawing next time around, such as more of her, and some other little items, like a background or such.